Marathon weekend reached fever pitch as more than 10,000 people dashed through Midtown Manhattan at the Abbott Dash to the Finish Line 5K and USATF 5K Championships. The race, which took place one day before the 2018 TCS New York City Marathon, started outside the United Nations, passed Grand Central Terminal and Radio City Music Hall, and finished at the world-famous TCS New York City Marathon finish line at Tavern on the Green in Central Park. This was also the second year that the annual 5K race hosted the USATF 5K Championships, and the men’s race didn’t disappoint as Paul Chelimo and Shadrack Kipchirchir were neck in neck as they sprinted down the Central Park stretch, with Chelimo taking the win by the slimmest of margins, with both recording 13:45 on the clock. In 2017, Kipchirchir finished one second ahead of teammate Chelimo at the race and at a press conference earlier this week, the latter vowed to win this year’s edition. “I can’t come here two years in a row and not win. If I don’t win this year, I am not going to show up next year,” he said jokingly. Looks like we could see Chelimo back on the streets of New York on November 2, 2019! The women’s professional race saw a dominant performance by Emily Sisson, as she broke the tape in 15:38. 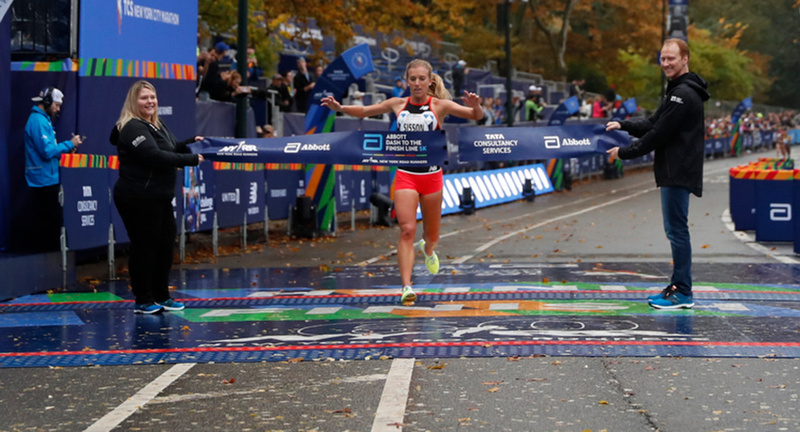 Sisson—who finished second in the 2018 United Airlines NYC Half—broke away from the pack midway through the race and cruised to victory in Central Park, 12 seconds ahead of Erica Kemp in second place. And for those not running the marathon, it gave them a chance to cross the iconic finish line, as well as take in the sights of Manhattan. For many runners, they used the race as part of NYRR’s 9+1 program, which guarantees them entry into next year’s 26.2-mile race. #TFW you get to cross the #TCSNYCMarathon finish line a day early because you just crushed the #AbbottDash5K. 🤗🙌🤩 We’re so ready for tomorrow! Post race, all eyes turned to the big one tomorrow—the TCS New York City Marathon, which will see more than 50,000 runners run the five boroughs of New York City. You can track runners on the course, as well as create Cheer Cards Presented by Biofreeze, using the TCS New York City Marathon app Powered by Tata Consultancy Services, and watch the race live on WABC-TV, Channel 7 and ESPN 2. And check ItWillMoveYou.nyc throughout the day for full coverage of 2018 race. For last-minute advice on spectating, here’s some top tips provided by our expert bloggers.